It’s been around since 2011 and has recently seen its value rocket upwards to the tune of £517 million, despite founders Evan Spiegal, 22 and Bobby Murphy 24, not yet being able to come up with a profitable business plan. That’s not enough to deter the “heavyweight backing” that Snapchat report attracting though, with the latest funding attracting such names as Michael Lynton, chief executive of Sony Corp US, who will now, alongside others, join the board. 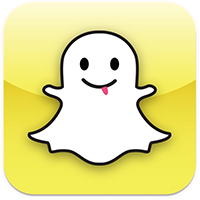 Snapchat is the latest social photo-sharing app to become the “darlings of the start-up social media sector”. The app is available for both Android and iOS and allows users to take a quick snap, assign a comment/caption and send to friends. What sets it apart from other photo apps, such as Instagram and Vine, is that the picture automatically “self-destructs” within 10 seconds of it being received. The app was first envisioned as a design project by Speigal and Murphy at Stanford University just a little shy of two years ago. The app caught on well with teens, especially since it’s claimed that once photos are destroyed they are gone from the app servers too. This means that photos are less trackable of course, which could help to prevent teens damaging their digital identity for the future. In February, around 60 million photos were sent using the app, a figure that has now risen to 200 million. As well as already being valued higher than the $715 million that Facebook paid for Instagram, Snapchat has also successfully seen off Facebook’s attempt at a rival app, Poke, which failed to be any competition. In fact, its 200 million snaps a day is much better than Instagram’s 40 million images sent daily. The beauty of the app is that it will appeal to those who have concerns surrounding privacy on social media. However, privacy campaigners have warned that the photos may not be as temporary as it seems, pointing out that screenshots can be taken of sent images and even when deleted from the servers, images will be accessible with the “right forensic tools”. According to Snapchat, sent images are not reviewed by the team and whilst they acknowledge that some of the sent content is “lewd”, it only makes up a small proportion of what users send. As for younger uses, SnapKidz has been launched for younger kids, before that anyone younger than 17 years had to get parent’s permission. So what’s next for Snapchat? Well, it’s all very well attracting big investors, but they will require a return at some point so the next step has to be in monetising the app. This is likely to be through paid advertising models and really doesn’t present anything new in that respect. It certainly seems that the app is safe from competition right now, if even Facebook’s version couldn’t cut the mustard, despite it being more advanced with better features. The founders of Snapchat have also done the intelligent thing and patented the ‘speed’ feature of it. It’s thought that the most recent investments will be used to grow the Snapchat staff and whilst they are “very interested in native advertising,” it’s thought that initial attempts to monetise will be through in-app purchases. “There tends to be pressure on companies to avoid generating revenue in the early stage,” Spiegel told TechCrunch’s Billy Gallagher in May last year. It’s thought that the founders are “pushing back the monetisation timeline” in order to first ensure that they have a strong, growing user base. MySocialAgency are a UK based social media agency. Get in touch today to see how we can help reshape your marketing for the digital age.